Quantum Key Distribution (QKD) is a technology that exploits a fundamental principle of quantum physics – observation causes perturbation – to exchange cryptographic keys over optical fibre networks with provable security. The study of QKD has therefore acquired a new sense of urgency: it is simply not possible to wait until the arrival of the quantum computer to design and test suitable cryptographic methods. The Clavis3 was designed as a research platform, with both automated and manual operations. The user can therefore experiment with different parameters and study various setups. 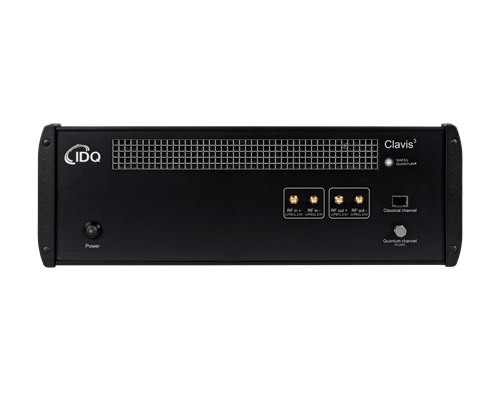 In addition, the Clavis3 receiver, the Clavis3-B, can use external single-photon detectors, which can be provided either by ID Quantique, or by the end-user himself. Secure key exchange is possible over distances of up to one hundred kilometers, as well as over standard telecom networks with WDM. The optical platform is well documented in scientific publications and has been extensively tested and characterised. A comprehensive software suite implements automated hardware operation and complete key distillation. The secret keys provided by Clavis3 can be fed in various encryption systems.